Geography was one of my favourite subjects in school and I loved learning about the Earth and especially about weather. After finishing high school I considered studying to be a weatherman (meteorologist) for the Federal Government. Applications for any position with the Government meant that you had to be fingerprinted so I visited a very clandestine office of the RCMP on St. Clair Avenue East and had my fingerprints taken. So yes, the Federal Government knows exactly who I am! Further research about the position revealed that your first meteorological posting would be somewhere remote such as the Northwest Territories for a period of six months. So I decided against that career choice. But to this day the weather fascinates me. And modern technology has brought us a cornucopia of weather-related software and gadgets. In particular, applications for the iOS platform and the OSX platform have provided us with hundreds of choices. 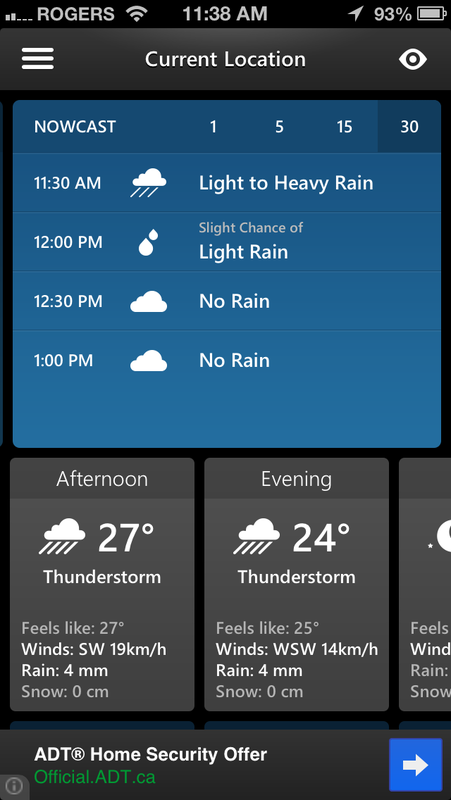 I am an app junkie and always download the latest and greatest weather app that comes along. Some are duds and I immediately delete them, but others are gems especially when they take a different approach in presenting you with what you need to know. I currently have 22 weather-related apps on my iPhone 5 and far fewer on my iPad Mini. I will attempt to provide a review of each piece of software and rate them on a one-to-ten scale and scale down the list to the ones that I rated nine or higher. Prices quoted are from the Canadian iTunes App Store and when I say that an app is iPhone-only, you can still load the app on an iPad but the app has not been optimized for the larger screen size of the iPad. 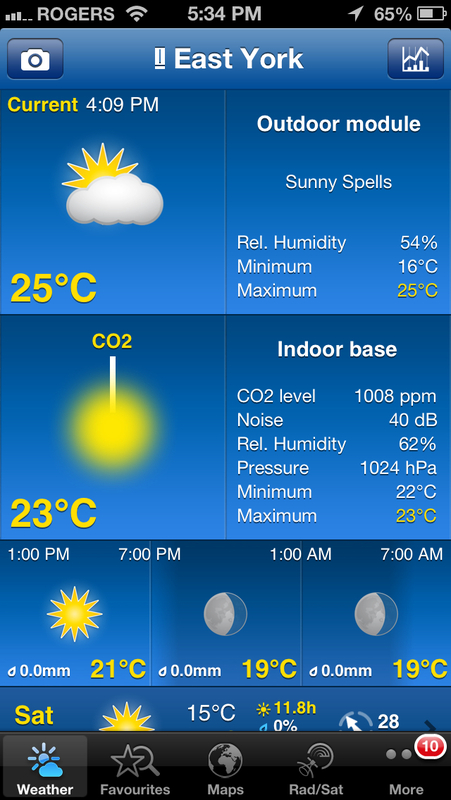 In no particular order, we start with Weathercube which is available for both the iPhone and the iPad and costs $0.99. It has a simple and clean interface. The cube pivots from left to right and from top to bottom with swipes. The interface is cute but I don’t find it to be a very interesting app. Rating: 5 out of 10. Yahoo! Weather is a bit more interesting. 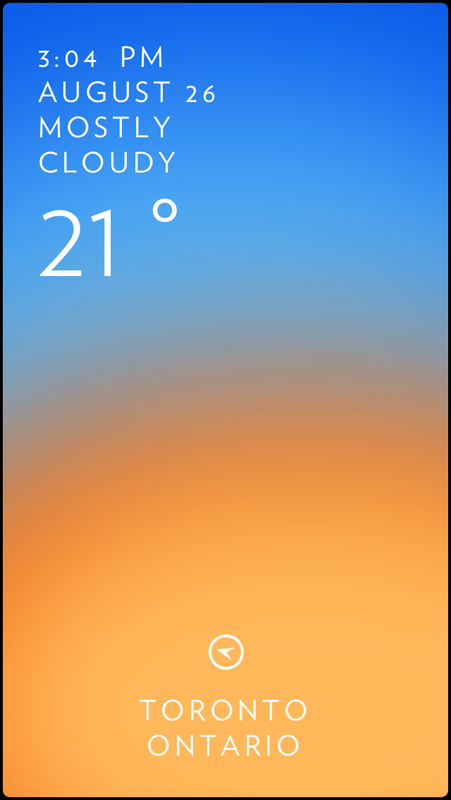 It is a free iPhone-only app, which provides you with photographs of your selected location that match the time of day and current weather conditions. Depending on the location city for your weather selection, it goes out to flickr and sources an image from that city. 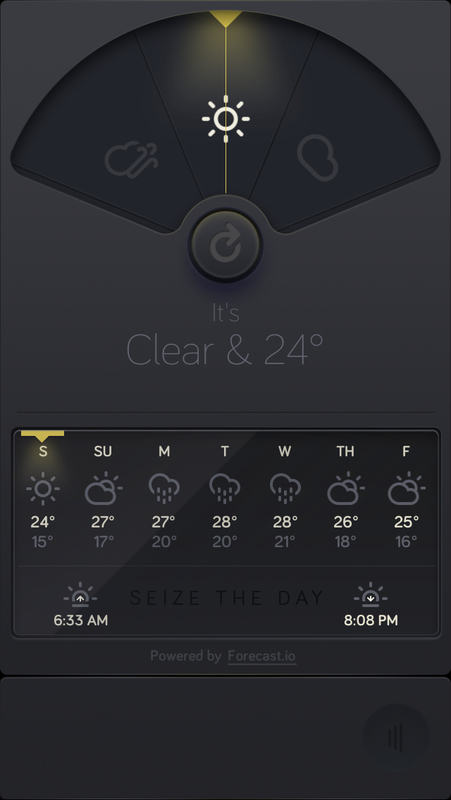 It’s a simple and clean interface and by swiping up it provides either a five-day or 10-day forecast. 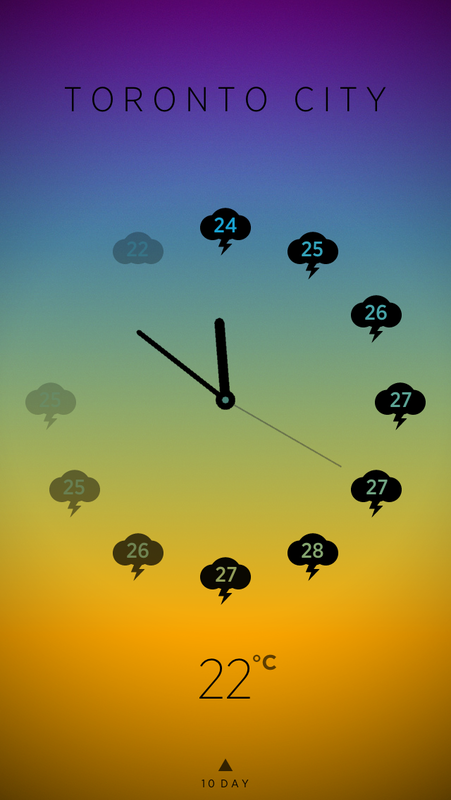 It also gives you a map, precipitation predictions, wind and pressure, and sunrise and sunset times. It’s elegant and I really like this one, and as I mentioned, it’s free! Rating 9 out of 10. 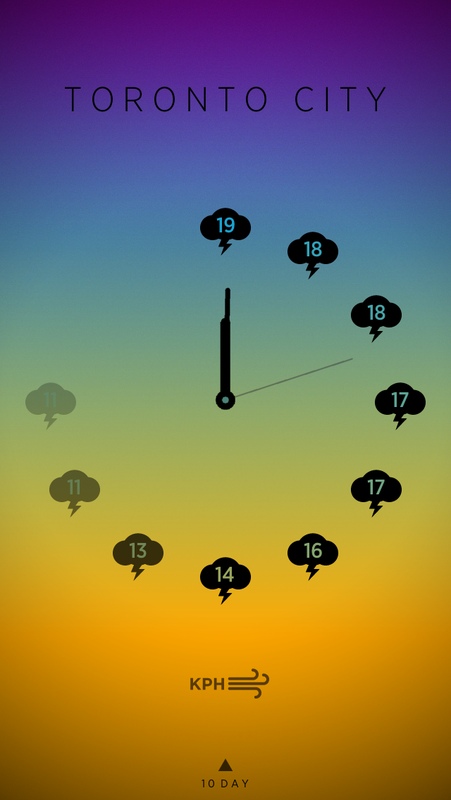 Weathertron is $0.99 and there are iPhone and iPad versions. It is limited to showing a single city at a time. 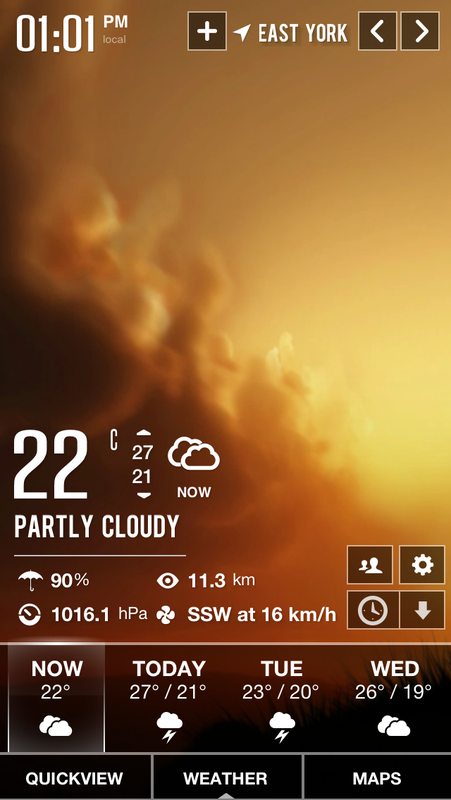 If you wish to get the weather for another city you can enter it on another page but you lose the current city. I give this a 7 out of 10. 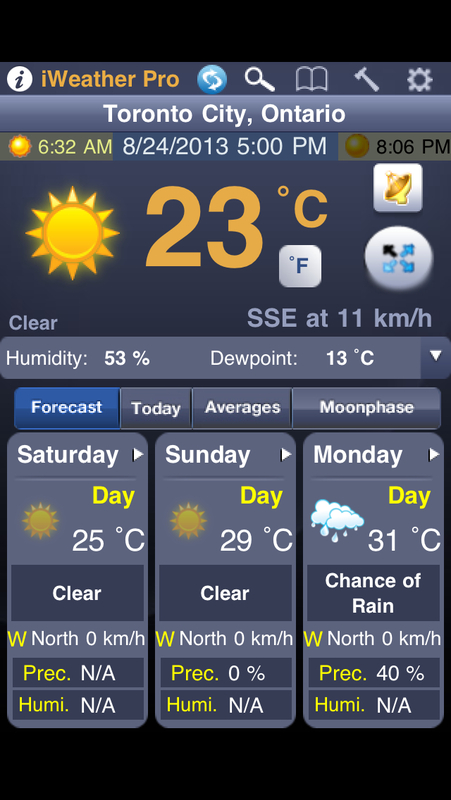 WeatherPro is $2.99 and has iPhone and iPad versions. This is a complex app and offers a great deal of information. 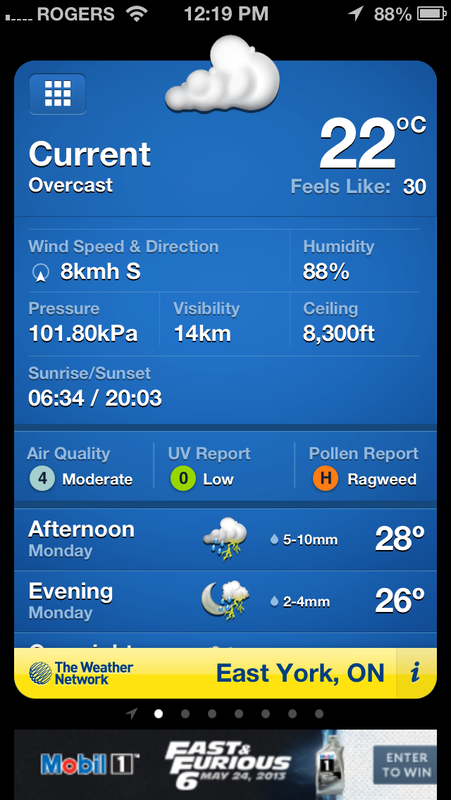 Scrolling the first page gives you current conditions and an eight-day forecast. 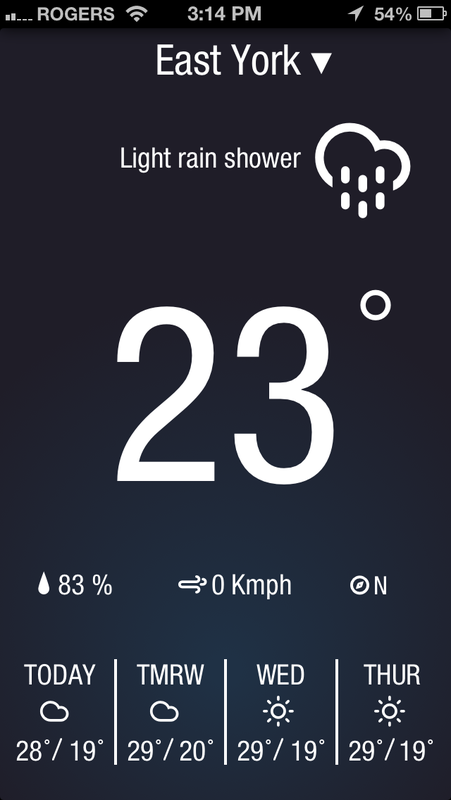 One great feature is that this app picks up information from one of my weather hardware gadgets, Netatmo, which I will talk more about in a minute. 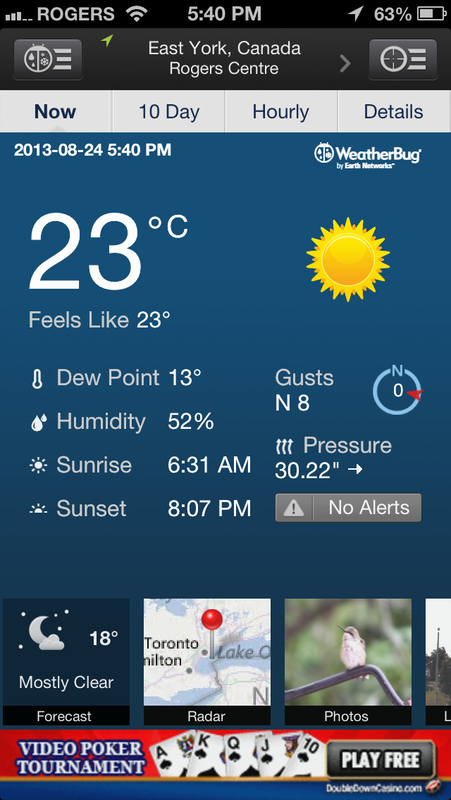 My outdoor module information is shown at the top of the page, so this is the weather right here in my backyard—not at Toronto Island Airport or Toronto Pearson Airport. That’s as local a forecast as you can get. The Favourites button on the bottom brings up any other cities that you have programmed into the app. 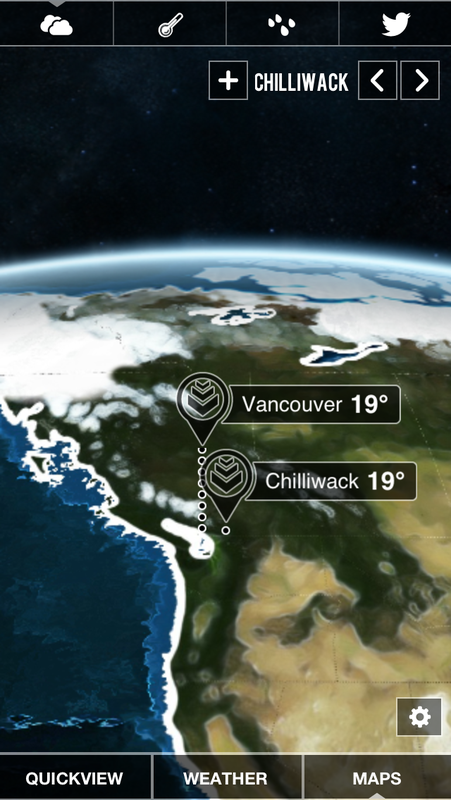 So at a quick glance you can see the current conditions for all of your favourite cities. The Maps button brings up a local map, but when you try any of radar, temperature or other buttons it brings you to an in-app purchase screen. For $5.99 you receive a Europe Premium 12 Month account. This gives you high-resolution weather maps with 14-day forecasts and European and US radar. So for Canadians, your $5.99 is pretty much a waste of money. The Rad/Sat button does bring up a North America satellite map, which is fine considering there is no extra charge for this feature. 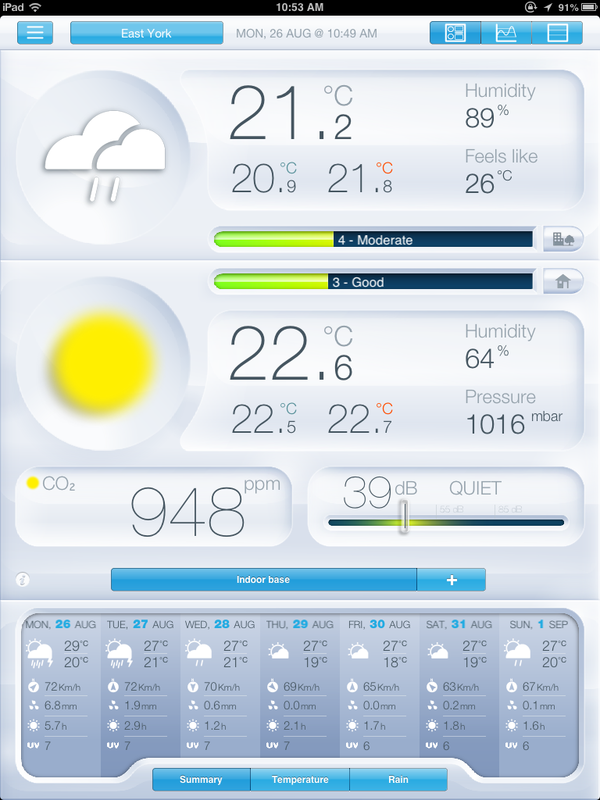 The More button brings up Weather News, Air Pressure Map and a host of other weather-related information. This is a very full-featured app and I rate it 8.5 out of 10. I love this combination of hardware and software and it is the first app that I check every morning. The outdoor module measures air quality, temperature and humidity, while the indoor module measures temperature, humidity, pressure, sound levels and CO2 levels. Sound levels would be important if you worked in a noisy environment and wanted to keep tabs on the exact levels. The CO2 measurement is quite interesting. They suggest that when levels exceed 1,000 parts per million, you should ventilate your home. When we have the air conditioning running for days on end, I do see the CO2 levels rise and you get a text alert letting you know if you are over the 1,000 ppm level. Opening a few windows or doors quickly gets the level back to normal. Lots more information is available at the Netatmo website or take a look at this YouTube video. This rates a solid 10 out of 10 for me. Foresee is $1.99 and has both iPhone and iPad versions. By looking at weather data, the software provides you with the best times for your activities such as gardening, golf, walking, eating outside, photography, barbecuing, fishing, camping, etc. You select your activity and tell the software your ideal time of day for the activity along with the temperature, cloud cover, precipitation, wind, humidity and UV index that you desire. It is an interesting concept but I don’t use this app very often. Rating of 5 out of 10. SkyMotion is free and available for the iPhone only. Along with the current weather conditions, it really concentrates on the prediction of precipitation. Swiping the top panel to the left brings up a more detailed prediction of rainfall, which can be broken down into 1, 5, 15 or 30 minute intervals. I find the app to be quite accurate and rate it 9 out of 10. 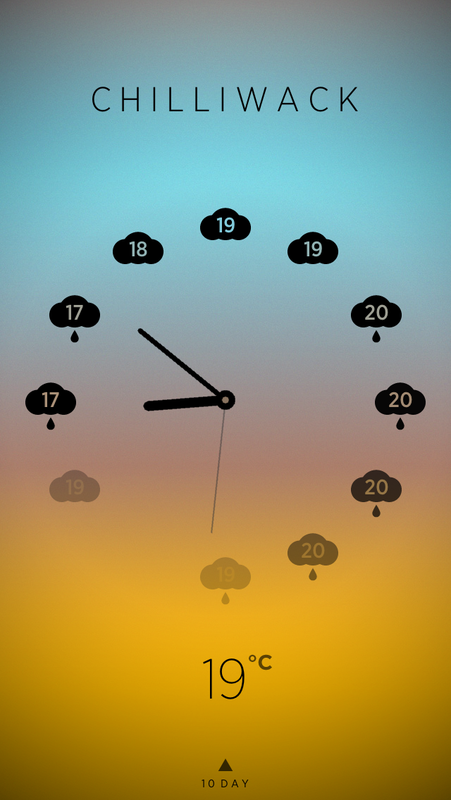 Climate Clock is $1.99 and is iPhone-only. 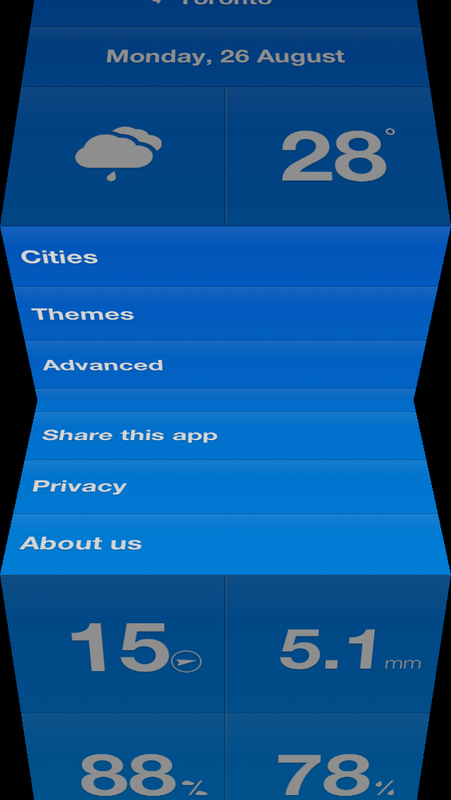 And swiping from right to left scrolls through your favourite cities and shows the local time of day as well—brilliant! 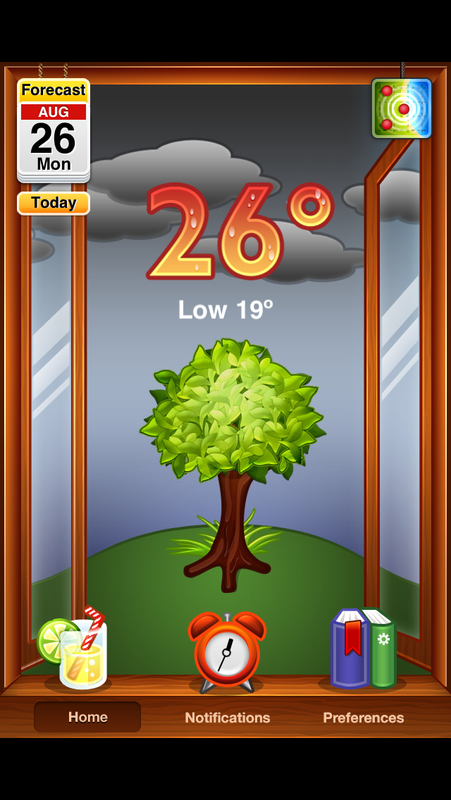 Tapping the screen changes it to show precipitation and wind speed. I love this app. I rate this one at 9.5 out of 10. 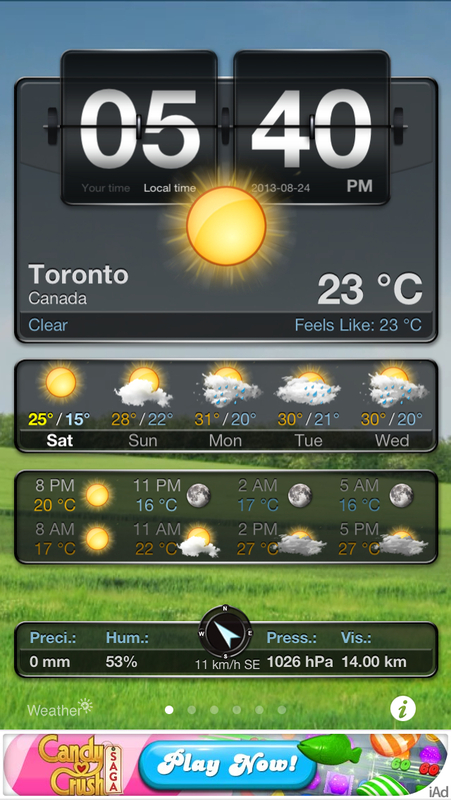 The Weather Network is free and has both iPhone and iPad versions. I find the interface a bit clunky so I give this a 6 out of 10. Outside is $2.99 and is iPhone-only. It takes a graphic approach in telling you the weather quickly. 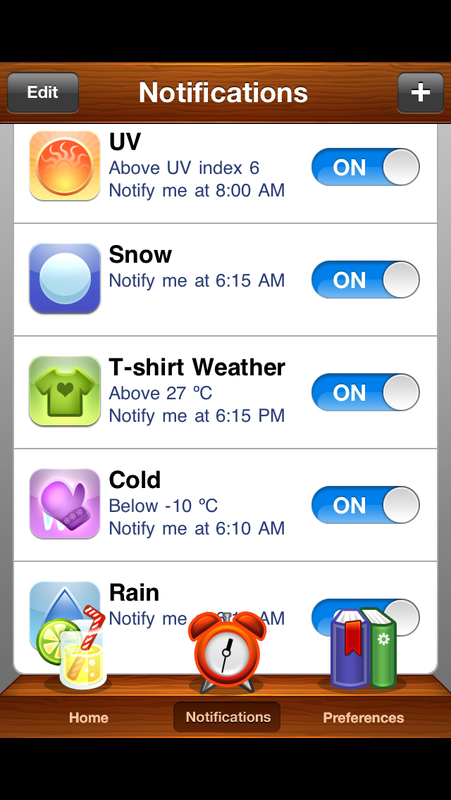 And in the Notifications section you can set alerts for pre-determined levels of UV, snow, t-shirt weather, cold and rain. You can set the time of day for these alerts as well. I rate it 5 out of 10. 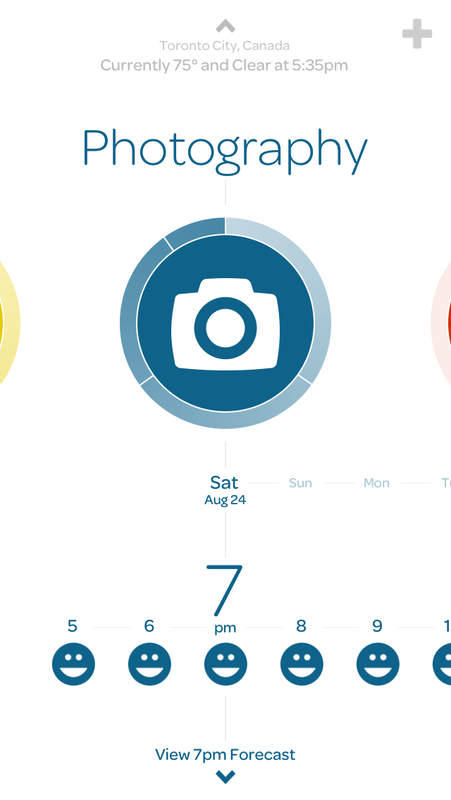 Clear Day is $1.99 and has both iPhone and iPad versions. It was formerly known as Weather HD. The high-definition videos match the weather and time of day and they are stunning! Canada Radar is $0.99 and is iPhone only. 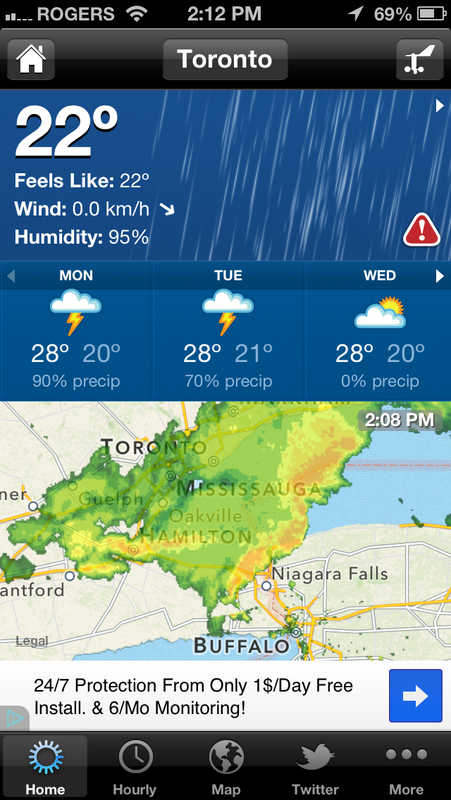 This is a very simple app that really only does one thing—real-time radar imagery from Environment Canada. There is an in-app option to purchase precipitation alerts, which costs $4.99. 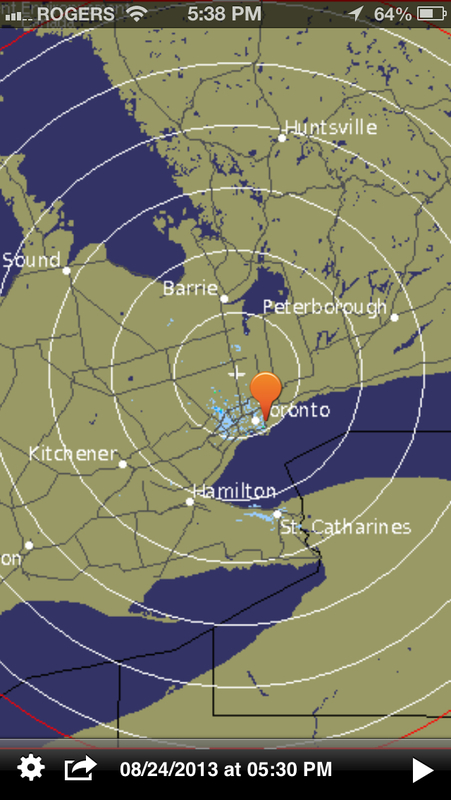 This will give you push notifications when precipitation approaches your area. I have not purchased this option. 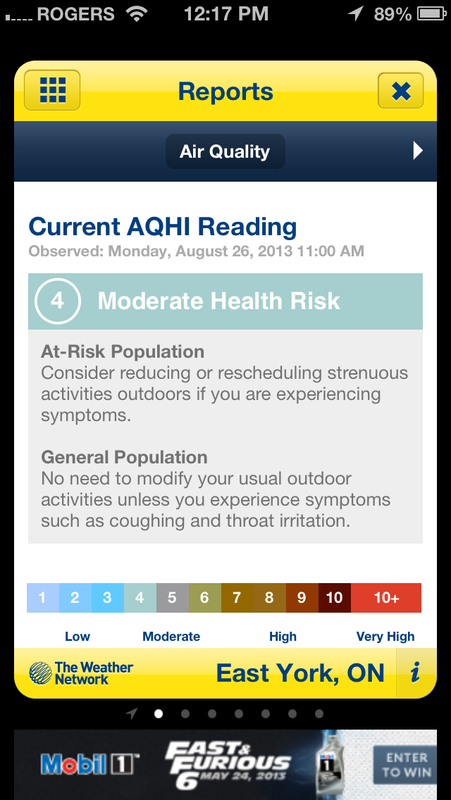 The app works as advertised and I like it since the data comes from Environment Canada. 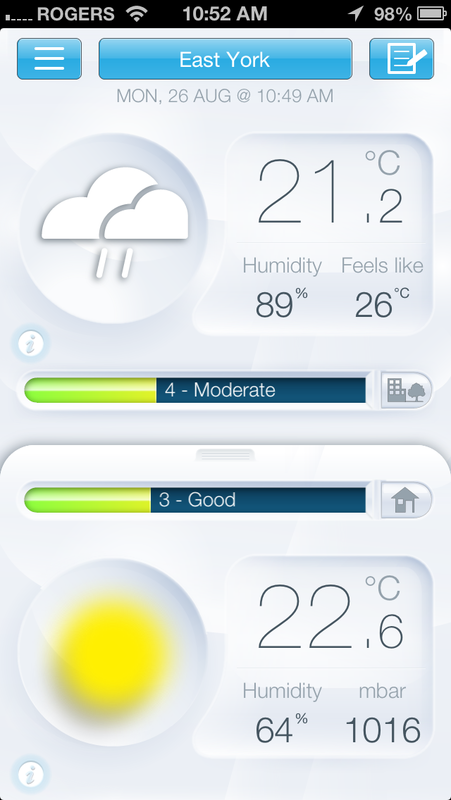 Rating 8 out of 10.
iWeather Complete Pro is $0.99 and is iPhone only. I find the screen to be quite cluttered and the buttons are very tiny. The Today and Average buttons gave a message saying “Data not available for this location at this time. Please re-visit soon.” The satellite button brings up an Infrared screen and there are additional options for Webcam and Radar which both gave the same “Data not available…” message. This makes me think this app is strictly for the US market, although the description says you can search for weather for any city in the world. 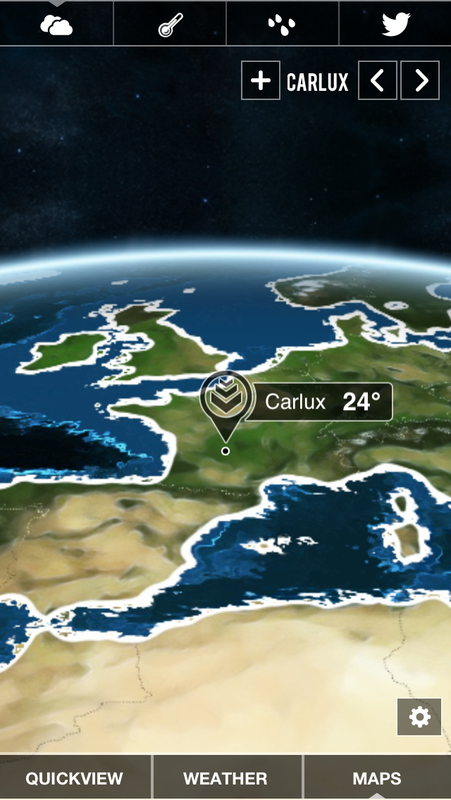 Neither Carlux or Sarlat, France, were able to be found although Paris, France, was there. 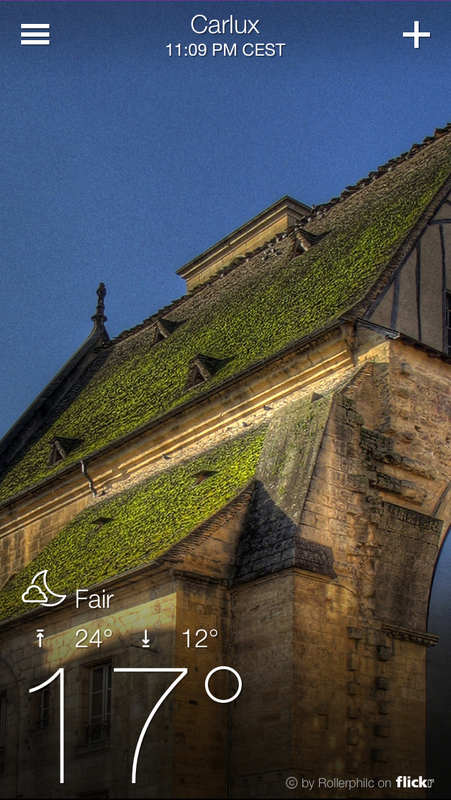 Unlike many other apps there is no ability to swipe to see another city. You have to select the city from a bookmark menu, which is clumsy and time-consuming. 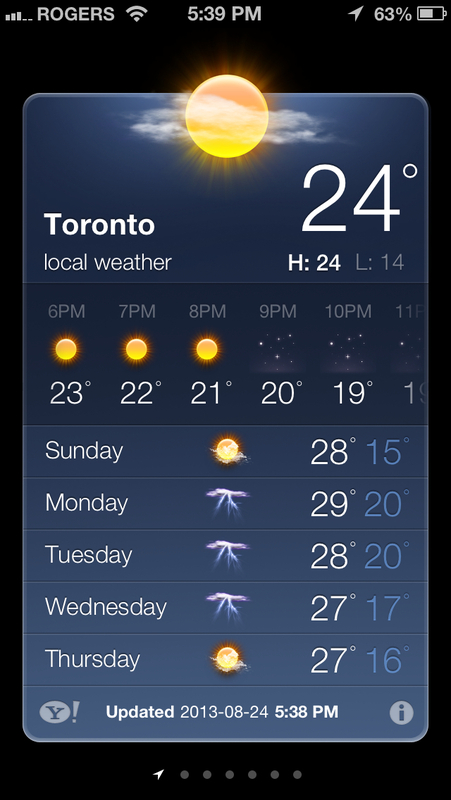 Weather app from Apple, powered by Yahoo! It’s built in as part of iOS and is iPhone only. A simple and clean-looking interface. It’s free since it’s part of iOS and cannot be deleted from the iPhone. 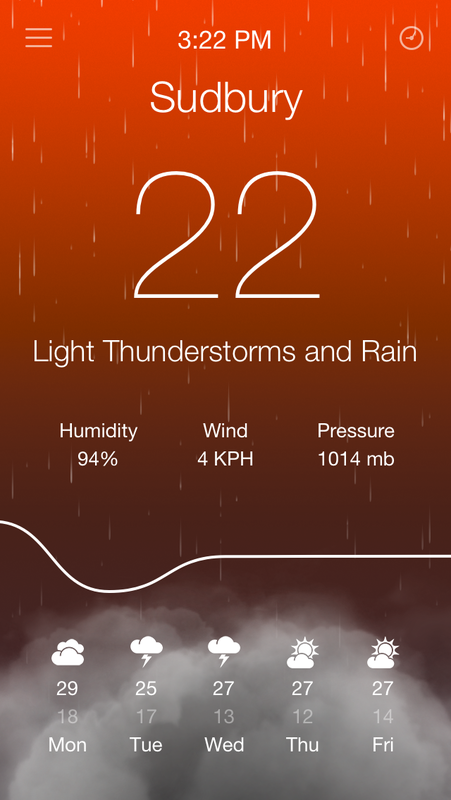 The app will be completely redone when iOS 7 is released, with animations that represent the current weather. Rated 6 out of 10. 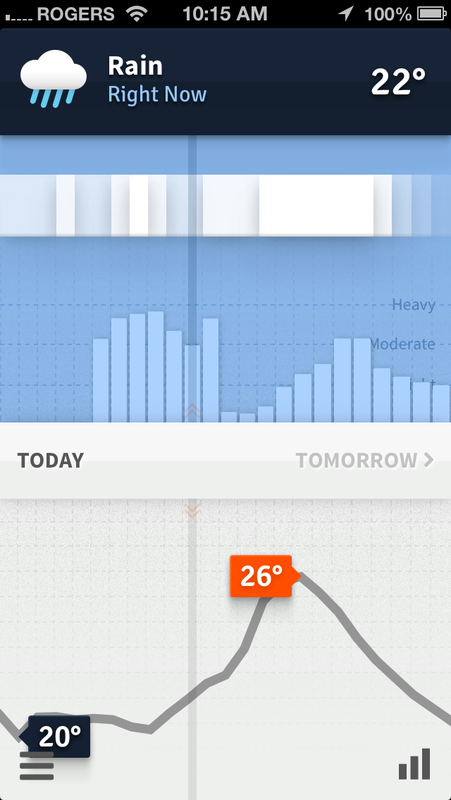 Weather Underground is free and has both iPhone and iPad versions. This app delivers a great deal of information. 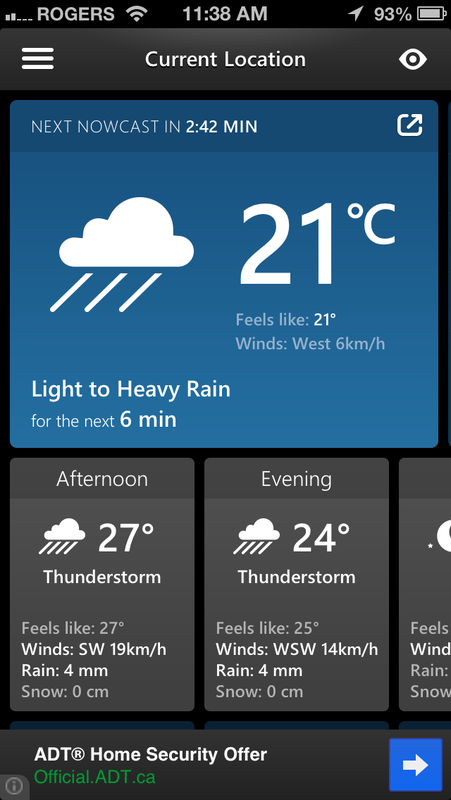 I like it since it is using data from neighbourhood weather stations. I found a station that is less than one kilometre from my house. 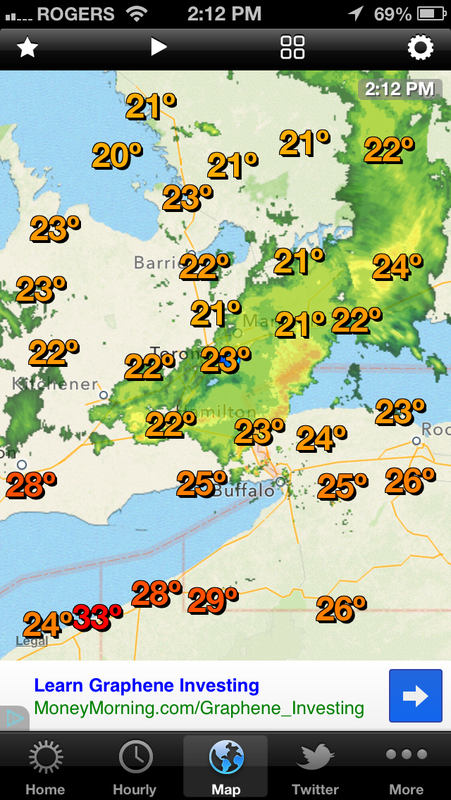 It also has temperature, radar and wind speed maps. 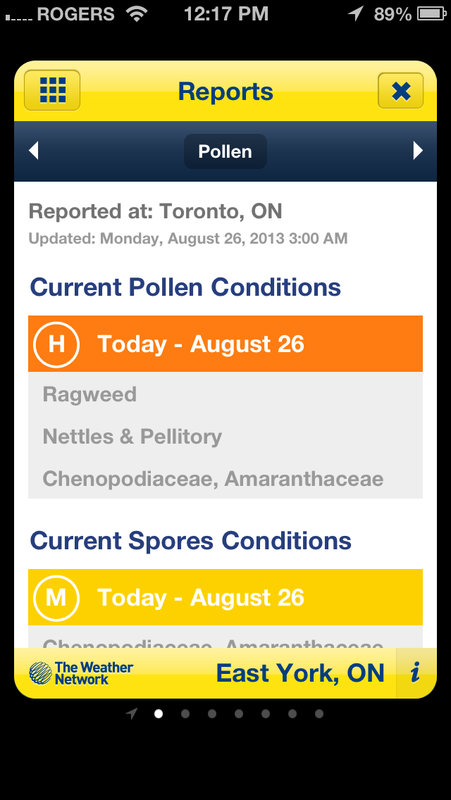 WeatherBug is free and has both iPhone and iPad versions. 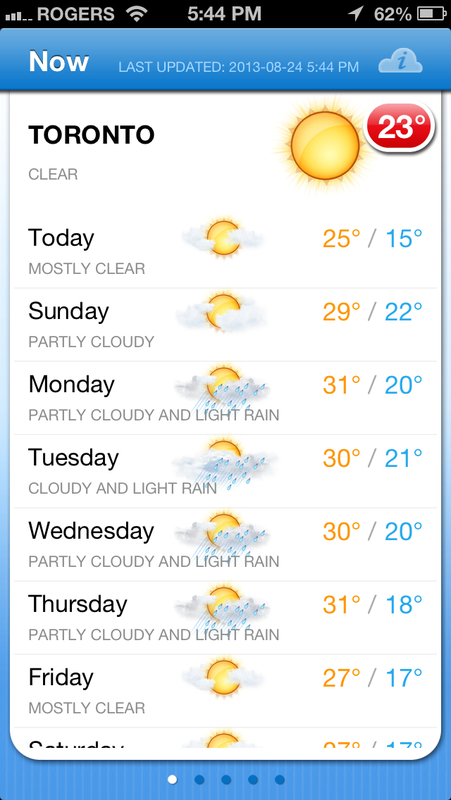 The forecast is presented clearly with everything on one screen. It’s unfortunate about the ad at the bottom taking up valuable screen real estate. I do like the ability to swipe through your preset cities at the top. There was no radar information for France and the Spark feature, which detects how close lightning is to your location, only works in the US. 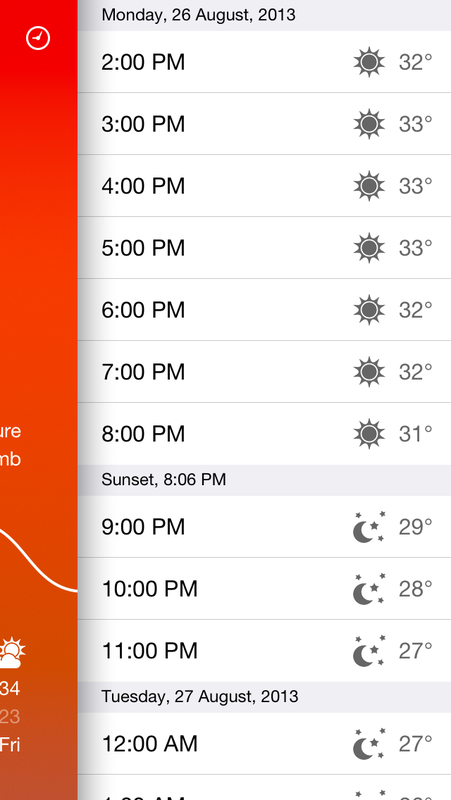 Weather+ is free and has apps for both the iPhone and iPad. 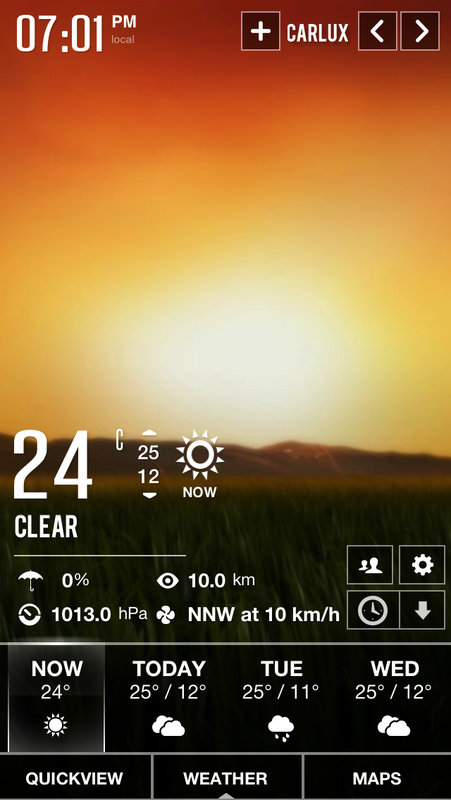 Similar to Clear Day, it has nice animations of the current weather conditions. Everything you need is presented on one screen and swiping right to left brings up your next preset city. You have full control over how much or how little information you want. Simple and slick. Rated 9 out of 10. 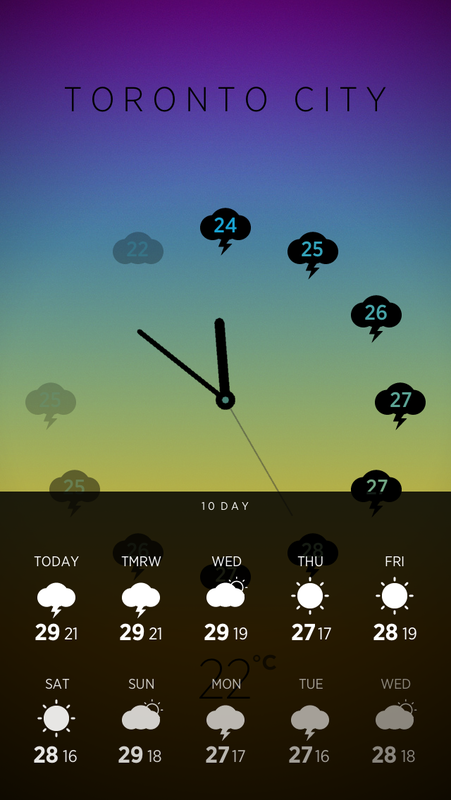 Weather Dial $1.99 is an iPhone-only app. 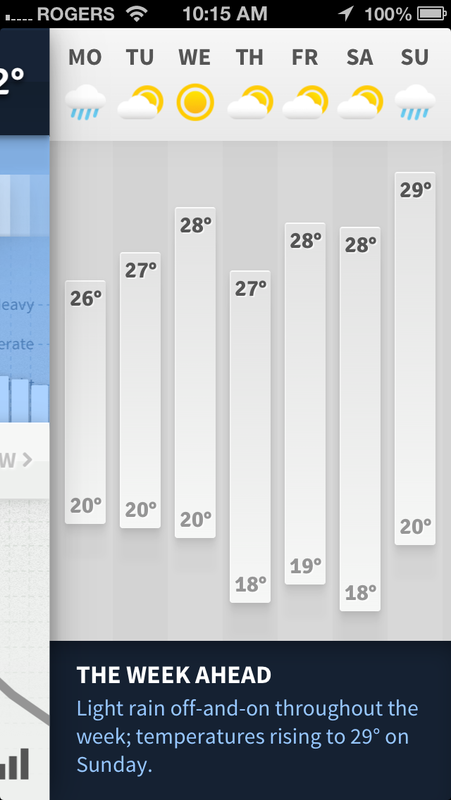 A simple and clean interface with current temperature and seven-day forecast along with sunrise and sunset times. It’s probably all that most people need. Rated 9 out of 10. Solar is free and available for the iPhone only. Minimalist. Pulling down from the top gives the forecast for the next three days. 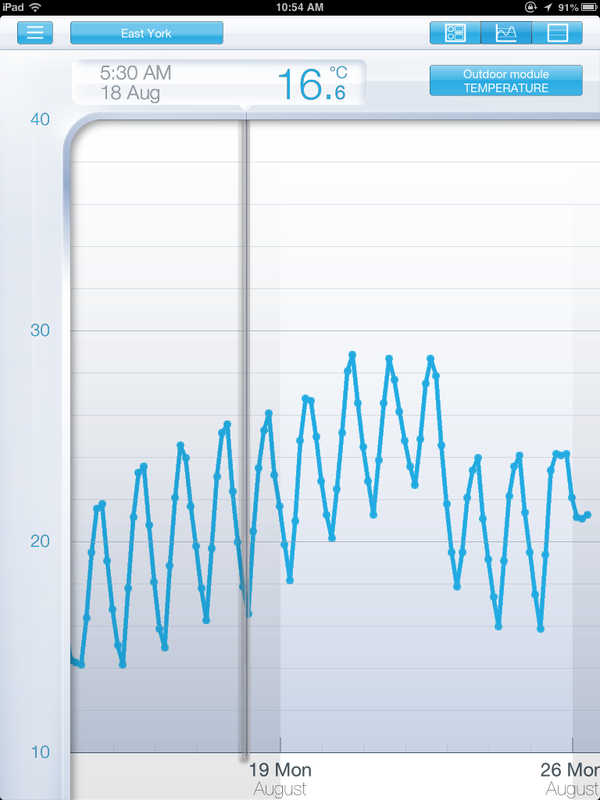 And pushing upwards shows the forecast changing as time moves forward. 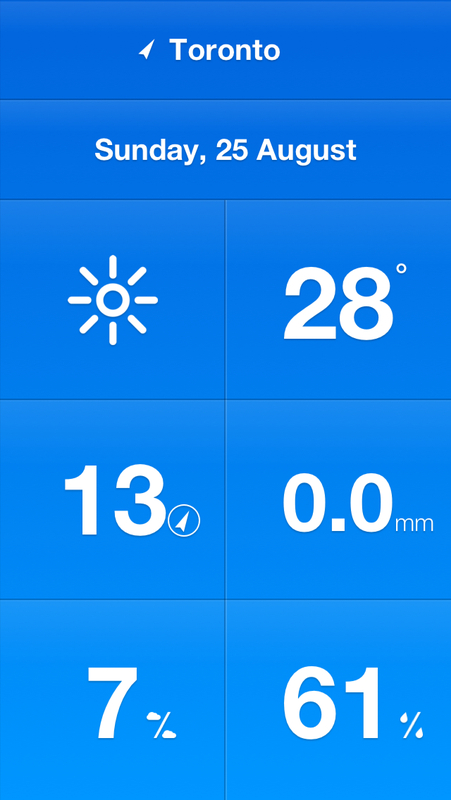 WeatherNeue is free and is an iPhone-only app. Not much to say here. Again a simple and clean display but there is no option for adding cities, so it’s one location only. Rated 6 out of 10. Aero is $0.99 and is an iPhone-only app. 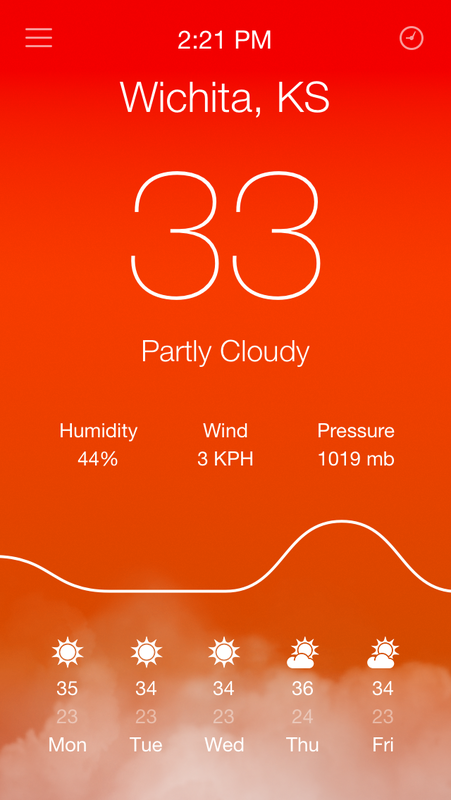 Celsius is $0.99 and available for both the iPhone and iPad. 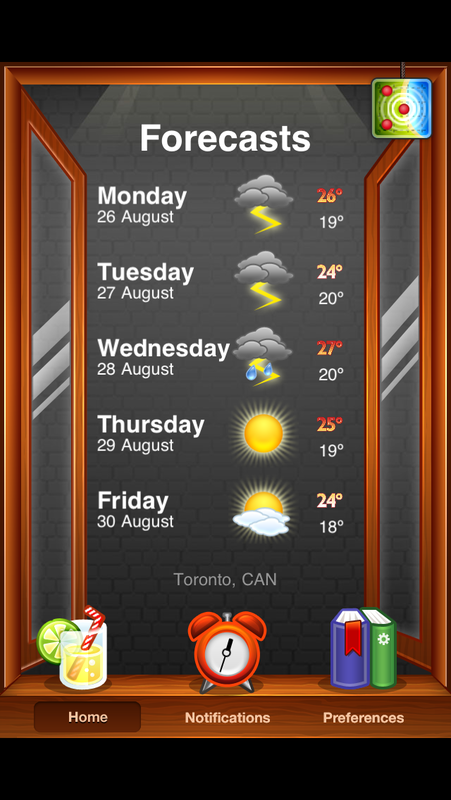 The main screen shows a 10-day forecast with high and low temperatures. Swiping left brings up your preset cities. 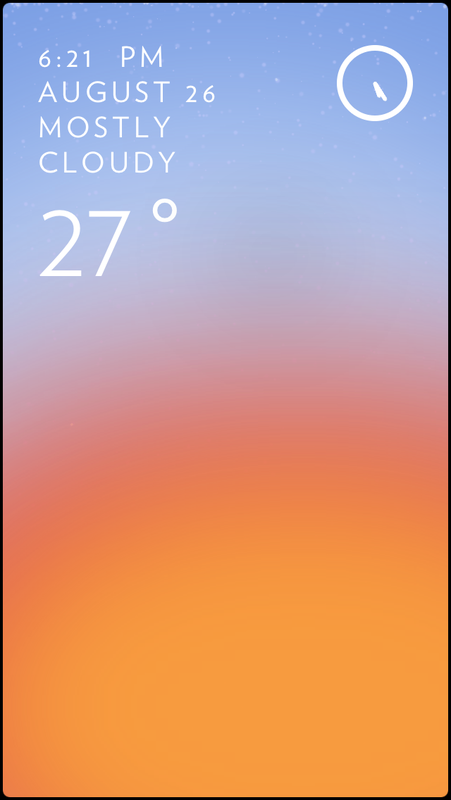 Another nice touch is that the app icon shows the temperature. Rated 8 out of 10. So there you have it, 22 apps reviewed. Your needs for a weather app would probably be different than mine. And if you are interested in the weather conditions where you have friends and family in other cities and countries, then some of these apps just don’t cut it. My hands-down favourite is Netatmo, which scored a 10. Climate Clock 9.5; Yahoo! Weather 9; SkyMotion 9; Clear Day 9; Weather+ 9; Weather Dial 9 and Solar 9. If you have a favourite that I didn’t rate, please leave a comment.